Mystic Spiro (natural spirulina) is a Vegan source of Protein which has a high bioavailability than other sources of protein. Research says Spirulina contains all the essential amino acids. Mystic Spiro (natural spirulina) is a Vegan source of Protein which has a high bioavailability than other sources of protein. Carbohydrates are low in Mystic Spiro. Research says Spirulina contains all the essential amino acids. Mystic Spiro contains folic acid which enriches blood. 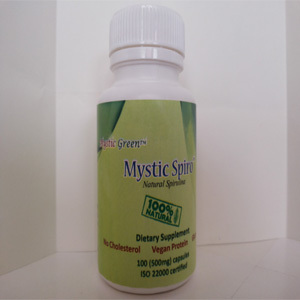 Essential fatty acids including GLA are naturally available in Mystic Spiro which enhances health. Researchers declared at the 1974 United Nation’s World Health Organization’s Food Conference that Spirulina is the “ Best Food for Tomorrow”. Research says nutritive value of 1 g (2 Capsules) of Spirulina powder compared to nutritive value of 1 kg green vegetable in end use form is found to be same. Available in 100g pouch, 250g pouch & 100 (500mg) Capsule Bottle. Mystic Spiro contains calcium, phosphorous, magnesium as in milk, Vitamin E equal to wheat germ, Vitamin B12 4 times higher than raw liver. Pigments viz. Phycocyanin, chlorophyll & carotenoids present in spirulina enriches health. Selenium as a powerful antioxidant detoxifies the whole body.